Reach your target audience cost effectively and profitably with text marketing. Voodoo SMS lets you send text messages in bulk to your list of customers, clients or prospects to generate leads, promote your latest offer or improve brand recognition. Our user friendly platform is built with text message marketing in mind. Easily create or upload your contact lists, prepare messages and send out immediate or scheduled broadcasts to your target audience. We work with small businesses and leading companies in the UK to deliver text marketing that truly works. With our pricing model, the more marketing text messages you send, the less you pay for each message, helping your business achieve a great ROI from your campaign. Why should you use text message marketing? Did you know that 66% of UK people have nomophobia -- a fear of being without a mobile phone? This amazing statistic, discovered in a SecurEnvoy survey, shows why text message marketing is so effective for businesses. Most mobile phone users read texts within minutes of receiving them and almost always open and view their new messages. This advantage in response time and rate makes SMS a much more effective marketing channel than email and traditional direct mail marketing. When conducted effectively, SMS marketing can help you generate new sales leads, improve customer loyalty and encourage repeat purchases. A short, powerful message delivered using our bulk text marketing platform can generate measurable results for your business. How does our text marketing platform work? Using Voodoo SMS to send marketing text messages is simple. First, create and fund your free account. 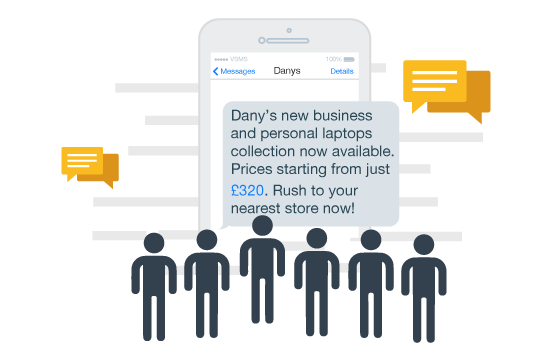 Our pricing system means you’ll pay less for each text message when you buy in bulk, allowing your business to cost-effectively send tens of thousands of marketing texts. To start your campaign, simply upload or create your first contact list. This is a list of your target recipients, such as existing customers or promotional competition entrants. Create your sender profile and prepare your first broadcast and you’re ready to start your SMS marketing campaign. You can deliver your message as an immediate broadcast or schedule it to reach your audience at a specific time. You can even schedule your marketing text messages to be delivered in small blocks, giving your business time to respond to the campaign’s results. Our user friendly system lets you create dynamic text messages with ease. Create messages with dynamic fields for a user’s name or phone number, or use our API to deliver retention and marketing texts directly from your application. Even if you’re not a “technical” person, you’ll find it easy to write and deliver your first marketing text message using Voodoo SMS. Our user friendly SMS marketing system lets you send marketing texts to your target audience from just 1.74p per credit. Create your account now and start a text message marketing campaign to generate real, measurable lead generation and sales results for your business.